The Tirumala is situated at highest of about 2,980 feet above the sea level and enjoys the hygienic and revitalizing climate. Above 40 to 50 thousands of people are visiting the Tirumala every day and an average of 70 thousands of them at peak seasons. The people visiting Tirumala are from different states, places, languages, cultures and with different status of people. Propagation of information to such people having different faiths and beliefs is a major and vital task and is a very important job. Tirupati Tirumala Devasthanams is using all forms of media to inform the people visiting Tirupati. Tirumala Tirupati Devasthanams additionally referred as TTD is Associate in supporting most of the trust that manages the Tirumala Venkateswara Temple at Tirumala. it’s additionally concerned in various social, religious, literary and academic activities. TTD employs approximately sixteen thousand folks to keep up the twelve temples and sub-shrines under its management in conjunction with the execution of its social activities. The Lord Venkateshwara temple in Tirumala, Andhra Pradesh – one of the richest Indian temple in terms of the revenue generation – earns one-tenth of its annual revenue from the sale of hair offerings by devotees. Every year, thousands and thousands of people visit the temple get tonsured to offer their hair to Lord Venkateshwara, in keeping with centuries of traditional practice. Due to which in the world increasingly fascinated with vanity, their modest offering has spawned a multi-million business – that of human hair export business – what with an ever-growing demand and need for human hair for wigs and the latest celebrity fad of hair extensions. As per the recorded fact in the year, the Tirumala temple earned nearly Rs.200 crore out of its total revenue of Rs.1, 949 crores, from auctioning human hair offering from devotees. 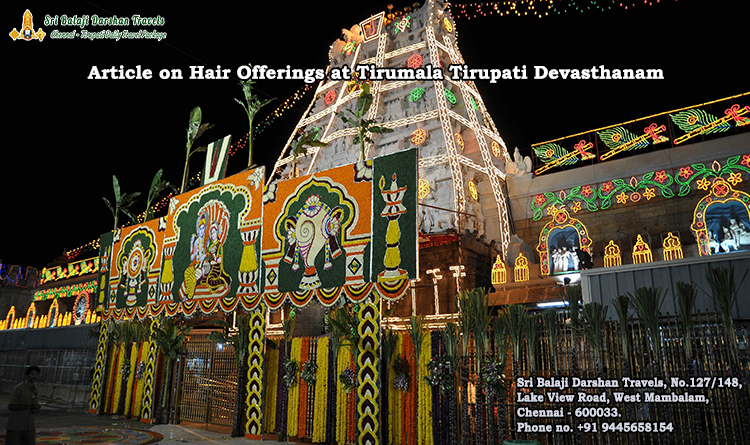 According to the executive officer of the Tirumala Tirupati Devasthanams (TTD) that manages the temple affairs, the projected revenue from auctioning hair is around Rs.150 crore, but going by the overwhelming of a large number of devotees day by day to pilgrims flooding the temple, it is expected to surpass every year. Recently, the temple authorities took to e-auctioning, courtesy of a spike in demand from traders across the world for the hair auction. According to another TTD official, a human hair is broadly classified into five categories depending on the length and texture of the hair – hair longer than 31 inches in the range varying between 16- 30 inches; 10-15 inches; 5 to 9 inches; and that of less than five inches. There is also a sixth-grade variety, grey hair, donated by senior people like senior citizens, albeit of zero-demand. “The long and uniformly trimmed hair is termed as Remy hair, which has a huge demand for markets in Europe and the US, where it is woven into wigs. The non-Remy hair, broken and short, has a huge demand and need in China, which in turn makes wigs and sells it in the American or African market, especially Nigeria. In the domestic market, Tirumala hair is very much popular in Mumbai for making wigs for film stars.